...spans over 50 years, and the stories of how these children move uncertainly into adulthood — and how their parents adjust to the misfortunes that accrue — are painfully beautiful. (I went from bristling to weeping at 3 a.m.) Escaping the cage of your childhood can be one of the sublime miracles of growing up, though it sometimes requires more tools than the average jailbreak. a compelling novel, full of characters who ring true. A christening party, one Sunday afternoon, in southern California. Copious amounts of gin are consumed, leading to an illicit kiss. This brief encounter, in the kitchen, sets off a chain-reaction, breaking apart two families, and bringing them together again, with pieces missing or askew. Loosely, based on Patchett's own tumultous childhood, the novel spans five deacades, looking closely at the lives of all six children and the parents. Yes, some are dysfunctional, groping their way to an uncertain future and others are more sure-footed. Unlikely friendships evolve among the siblings and some end up, hopelessly out of reach. This book caught me by surprise, with it's depth, sense of humor and uncanny insight, into the human condition. And of course, the prose is delicious. On a sunny afternoon in Los Angeles, Bert Cousins shows up uninvited to Franny Keating’s christening party – with a large bottle of gin. In relatively short order, the celebration is wildly out of hand, and Cousins has kissed Beverly, Franny’s mother, setting in motion the dissolution of two marriages and the blending of the Keating and Cousins families. Commonwealth, ambitiously spanning five decades, is the story of how the chance encounter affects the lives of the four adults and the six children involved. The Keating and Cousins children travel back and forth between Los Angeles, which remains home, and Virginia, where they spend summers together. They forge a lasting bond based on their shared experience. When in her twenties, Franny begins dating famous author, Leon Posen, she tells him the story of her siblings and parents (and step-siblings and step-parents), and her family becomes the subject of his new and wildly successful novel. Ultimately, the characters must come to terms with their guilt and their losses, and with the connections they have formed (or not) with one another. All the stories go with you, Franny thought, closing her eyes. All the things I didn't listen to, won't remember, never got right, wasn't around for. All the ways to get to Torrance. This is a novel about two ordinary families, tied together by divorce and remarriage, who are messed up in ordinary ways. What makes this book so extraordinary is Patchett's writing, which is so perfect as to fade into invisibleness, never getting in the way of this story, and her compassion and interest in every member of these two families. Each chapter reads like a short story, complete unto itself, and joined together, the chapters tell the story over several decades, beginning with the christening party where Bert Cousins first meets Beverly Keating, a meeting that will eventually result in six children spending summers together largely unsupervised, not naturally drawn together, but connected by proximity and shared experience in a way that will bond them through their adult lives. I wanted to like this book. I wanted to love this book! It's the story of a blended family over the decades of the children's lives, with various marriages, divorces, births, and one very tragic death as the centerpiece. In the last chapter, one of Patchett's characters comments about the difficulty of keeping a large cast of characters straight in her head and this appears to be a conscious nod to that very challenge in reading this book. But it wasn't just that most of the characters never developed into the terrain of the memorable; it's that the work it took to try to keep the characters straight (which kids were born to Bert and Teresa? Was it Beverly and Fix who had the christening party at the beginning of the novel?) wasn't rewarded. I understand that this very issue is part of Patchett's point. And I came to like Franny (it was her christening party) but I never rarely cared about the first-world problems this ever-shifting family faced, even though the tragedy of one child's death is hardly trivial. My impression was that Patchett rushed her writing, almost like she had a publication deadline or something. She could have taken another 75 pages and then, instead of telling me that a character was "the quiet one" or "the bossy one," she could have shown me that, could have made me feel it. Which brings me to my most central reaction to the novel: Patchett had a great story to tell but at no point in the entire novel did she evoke an emotional reaction in me. A novel with a primary LT tag of "family" should make me feel something. This one failed to do so. One beautiful summer afternoon in the middle of a christening party for little Frances Keating, the fate of two families is permanently changed. The events of that day ultimately lead to marital breakup for both Fix & Beverly Keating and Bert & Theresa Cousins. Commonwealth is the story of the impact on their children and on the children’s relationships with their parents and one another throughout their lives. A commonwealth is defined as “a group of sovereign states and their dependencies associated by their own choice and linked with common objectives and interests,” and is a perfect metaphor for the two Keating and four Cousins children. Every summer they come together in Virginia (incidentally, also a Commonwealth), sharing bedrooms, adjusting to different family rules, and enjoying more freedom as a group than they are granted on their own. But this freedom comes at a cost, which has a profound effect on the adult each child becomes. Family relationships have their own inherent complexity, but when you add on top of that all of the new possibilities with blended families, it just becomes a jumbled mess. What do you call the children your stepmom had before she became your stepmom? Or what do you call your stepmom if she and your father get divorced? The woman formerly known as my stepmom? But what seems like a mess to us is an opportunity for Ann Patchett. As she has demonstrated in her bestseller, Bel Canto, or my personal favorite The Magician's Assistant, Patchett is a master at capturing relationships. In Commonwealth, when Bert Cousins crashes a christening party for Franny Keating, and ends up kissing Franny's mother Beverly, he sets in motion a series of events that will drastically change the lives of both families. Over the next 50 years, we follow different members of the family through celebrations and tragedy. This is my first Patchett novel and while I didn't love it, I wasn't necessarily disappointed either. It explores a divorce and how that affects the children involved. I really liked that Patchett leaves a decent amount for you to fill in the blanks. What bugged me most about this novel was probably the amount of characters and the length of the novel itself. There were a lot of characters involved, but the book wasn't very long. That left me feeling like there were some characters who I just never really had the chance to understand, because I never really had the time to know them. . . despite spending decades with them. A Line or Two: "For the vast majority of people on this planet. . . the thing that's going to kill them is already on the inside." This story covers fifty years and several generations of two families bound together by infidelity, and the genuine affection that grew between the siblings of two broken families. Fix is a cop in California, married to the moviestar-beautiful Beverly. They are the parents to two daughters, Caroline and Franny. Franny is just a babe and the center of a christening party when deputy DA Bert Cousins shows up at Fix's door with a bottle of gin. No one knows how Bert's appearance at this party will change the lives of all involved. Bert and Theresa have three children at the start of their story, with one on the way, eventually finding themselves raising two boys and two girls. A drunken moment between Bert and Beverly grows into something more, and it destroys two families, but out if it a new one is born. Caroline and Franny live most of the time with their mother and Bert in their new house in Virginia, and in the summer Bert's kids join them. During those long summers in a sleepy town and on family trips, the kids grow to genuinely care for one another. They become true siblings, watching one another's back. Well, all except that darn annoying Albie, the baby of the group, who is the hyperactive sort and drives everyone nuts! This story follows these kids as they grow up, as their parents grow older, and as these kids begin having kids of their own. The story slowly builds up and then slowly unravels the truth behind what happened one terrible day that bound them all together forever. I'm not sure I quite understood this novel. I love Ann Patchett and this novel is well written but I mixed the characters up at the beginning especially their relationship to each other. The family dynamic is what makes the novel and I get that. it is about the ties and responsibilities family members have to and for each other. It is about neglectfull parents and miserable children . It is framed around a famous writer who turns the stories told to him by his lover Frannie into a successful novel called "Commonwealth". A young assistant DA, in mid-20th century Los Angeles, wants to avoid going home to a house full of his wife and children, so he grabs a bottle of gin and pops uninvited into a christening party for a cop's second child. His gin and freshly squeezed juice, thanks to an orange tree in the backyard, lead to dancing and an unexpected kiss or two. The party's aftermath includes new marriages and the bringing together of six stepchildren, four girls and two boys. They spent summers together in Virginia with a parent and step-parent, forging on as a group of individuals who find ways to get along and still be themselves. Their adventures exist in a world separated from the grown-ups who forced them together. They are forced into independence when, for example, one mother disappears for the afternoon by hiding in the car, running the air conditioning and laying down in the back seat. (She realizes that since she's parked in the carport she won't be killing herself.) Or there is the time their parents sequester themselves in one motel room until 2 p.m. while the children hike over to a lake after breaking into the family car to take another fresh bottle of gin and the father's gun. The youngest, Albie, is a constantly moving whirl who drives the others crazy. The oldest boy, Cal, is allergic to bee stings so he carries Benadryl. The kids give Albie "breath mints" that are really the Benadryl, and when he sleeps they play, explore and have adventures without his interference. "The six children held in common one overarching principle that cast their potential dislike for one another down to the bottom of the minor leagues: they disliked the parents. They hated them." "They had done everything they had ever wanted to do, they had had the most wonderful day, and no one even knew they were gone. "It was like that for the rest of the summer. It was like that every summer the six of them were together. Not that the days were always fun, most of them weren't, but they did things, real things, and they never got caught." 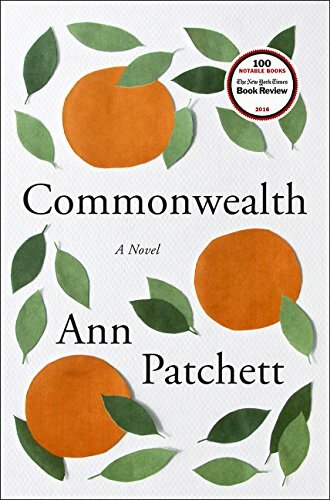 In Ann Patchett's luminous new novel, Commonwealth, the children grow up, find loves and lives of their own, and remember their past. Patchett has a way of making the normal things in life, such as a neighborhood party in which the grown-ups become tipsy, the stuff of legend, the kind of story that helps define a family for itself. That's befitting considering what happens with one of the children. Franny, the baby whose christening was celebrated, is a reader. She loves losing herself in books and is one of those naturally kind people who can consider the needs of others. Working as a cocktail waitress in a fancy Chicago hotel after law school doesn't click for her, Franny meets an author whose work she has adored. He is one of those older Eastern authors who lives on liquor and the adoration of young women. Leo Posen also is the kind of writer who appropriates what other people tell him. He calls Franny his muse. His novel, Commonwealth, extrapolated from the stories she tells him of those shared childhood summers, becomes a huge bestseller. Franny feels used after she had been having the time of her life. This becomes even more true when they "escape" to the summer house of a famous actress who wants a role in the film that will surely be made of this novel, and houseguests descend, and one sibling shows up unexpectedly. As with many contemporary novels, describing the basic outline of the story makes it sound dire. But it's not that kind of story. The older they grow, the more supportive they are, not out of guilt or obligation, but because that's who they are. And they are supportive across the generations and blending of families. There are some twists, one major tragedy and a lot of redemption. There is an interesting twist on Chekhov's admonition to writers about what happens when a certain object is introduced inn a story. The last sentence of the novel, belonging to Franny, is a delight. Most of the characters have endearing moments, but Franny is a special character. She's pretty much become my grown-up Jo March. Excellent dysfunctional family characterization novel with a heart. A little confusing in the beginning as there are many characters to meet but draws the reader in and the reader begins to care about the lives of this blended family. 4+ Early 1960, a christening party for baby Franny, where a spark will be ignited that will set up a chain of events that will echo down through the decades. Four adults, six children will be affected, and we will follow them as they try to maneuver through the many difficulties and tragedies fate will throw at them. The six children from the blended families will form, in the summers they spend together, a little tribe of their own and as a mother the things they got up to, with little adult supervision, made my hair stand on end. Pritchett puts together a story of families, flawed families, but family nonetheless and very few do it better. Many of the characters are not likable, my favorite being Fix, the cop and father of two of the female children and one of the girls, the grownup Franny. Yet, they are easily recognizable as people who we may know, or know of, their problems ones shared by many. Wonderfully written, moving back and forth between characters, the reader eventually comes to know something about all of them. Still, this is very much Franny's story, she is the one we come to learn about the most. Like in real life, all do not get a happy ending but getting there, reading about them was a wonderful experience. Reminded me a little of [book:The Children's Crusade|22609396], which I also enjoyed. Ann Patchett is a favorite of mine, and I eventually expect her writing to lose its freshness and become formulaic. But it hasn't yet. This story held me fast until the end. As is frequent with her books (excluding Bel Canto), it seems the story holds a truth that is lived into...and takes the whole story and all the characters to do it. I don't find myself underlining quotes or excerpts, instead, the whole story holds what I receive. Another excellent and thought-provoking novel by Ann Patchett. "Commonwealth" is such a perfect title. It's Virginia, and it also reflects the family the stepkids have made. It's them against their parents--no resentment, lots of sneaking and having a great time. And these 6 kids have made their own family, despite only spending weeks to months together each year. But it's not just the kids, it's the exes. There is not a lot of hate in here. The cheated-on ex helps out the son of the man who is now married to the first man's wife. The now-adult daughters of the woman who helped break up two marriages check in on the ex-wife of their stepdad--at their stepbrother's request. This describes real life--the Keating and Cousins families make it all work. But Patchett also shows, with Beverly's third husband's kids, that it doesn't always work this way--though maybe because their mother died when they were grown, so they don't know her nearly as well as they might have? I can vividly remember reading Ann Patchett's novel Bel Canto on my front porch one summer. I was mesmerized by her stunning story of a hostage situation in an unnamed South American country, and how I just fell into the book and didn't come out until the end. Her last novel, State of Wonder, about a research scientist who goes to the Amazon to search for her missing mentor, also brought me into a completely new world, one I wouldn't know that much about or even dream I would be interested in. Her newest novel is set closer to her own home. Commonwealth is the story of a blended family- a man with four young children leaves his wife and marries a woman with two children. (This happened to Patchett's family.) How that comes about, and the repercussions of the man kissing a woman who is not his wife at a neighborhood party, makes for a story that may be more relatable to most people. Albert is a district attorney in Southern California in the 1960's. He goes to a christening party for the daughter of Fix, a police officer he doesn't know well, and becomes enchanted with Fix's beautiful wife Bev. He kisses Bev and soon leaves his wife and children and takes Bev and her two daughters to Virginia to live. The opening scene of the party is brilliantly done. Fix the cop describes DA's as "the guys who smoked your cigarettes because they were trying to quit." Soon Albert is not only smoking Fix's cigarettes, he has stolen Fix's wife Bev. Years later, Fix tells his adult daughter Franny that Bev "didn't have her own character. She turned into whoever she was sitting next to. When she was sitting next to Miss Free Love then free love sounded like a great idea." The story spans five decades, and we see the children grow from six children thrown together in summers in Virginia to adults, all bearing the scars of a childhood that included a tragedy most of them never got over. Franny, the baby at the christening, grew up and met Leo Posen, a famous novelist who falls in love with her. She tells Leo her family's tale and he turns it into his comeback novel titled 'Commonwealth'. Franny is staying with Leo at the home of a wealthy actress in the Hamptons, and ends up acting as servant to the many people who decide to descend uninvited, including her younger stepbrother Albie, who comes to confront her about the book. There are many characters in this moving story, and Patchett excels at crystalizing each one in a few scenes. A book that covers five decades of a family could easily clock in at over 600 pages, but Patchett manages to create this world in just over 300 pages. Fix was my favorite character in the book, an honorable man who loves his children and even shows great kindness to Albert's first wife when she needed it. I also loved that Albert's first wife picked herself up and got a great job to support her family when her husband left her. Commonwealth is based on Patchett's family, and Franny is her doppleganger. Patchett has said in interviews about the book that she spoke to all of her siblings about the book, getting their blessing to tell the story. I'm not sure how many families would be OK with that. As I read the book I kept thinking, "what would a book about your childhood look like?" "All the stories go with you, Frannie thought, closing her eyes. All the things I didn't listen to, won't remember, never got right, wasn't around for." I think that line sums up Patchett's place in her life, one that many middle-aged people are dealing with as well. You get to a certain point in life and you contemplate how you got to where you are, and how your family played such a big role in that.